Was Bill using his new boxing gloves? Everyone loves a good conspiracy theory. New England Patriots head coach Bill Belichick, a man known for short answers and cold stares, showed up to meet the media this week with a decoration on his face. A fresh black eye. A shiner. And, of course, Belichick refused to divulge how he got it, which just opens the door for us to wildly speculate about the cause of the injury. Doesn’t that sound fun? So, even though we’re heading into a weekend full of intriguing playoff matchups, let’s instead waste our time guessing how Billy Boy got his shiner. I’ll put my professor hat on and give a letter grade to your reponses. Any other "Dirty Dancing" fans out there? Of course there are, because that movie is amazing and sparked my boyhood crush on Jennifer Grey. I wish she hadn’t decided to get a nose job. MrLarry gets an A+ for his spectacular effort right out of the gate. I’m not sure if we even need to continue, because there’s no way anyone’s topping this. Ahhh! You think Bill would be so vain as to get plastic surgery? Hmmm, not sure I buy it, but I’m more than willing to put that rumor out into the ether. Well done, indeed. You get a solid B. Here we go. Figured it would be a matter of seconds before I got hit with an avalanche of spying jokes. Eric, you seem like a good dude, so I’m going to give you a B. But I won’t let the spying jokes get out of hand. Oh, God. I forgot about Deflategate jokes. John, I’m giving you a D because Deflategate references are weak and you laughed at your own joke. Leave your LOLs at home next time. I’ll decide if it’s funny. Wait, so do you think he was peeping on Tom Brady or fighting with a Peeping Tom that could have been Tom Brady? Either way, I’m intrigued. Thanks for that visual! So, you’re saying this was a booze injury? Well, I’ve heard football coaches enjoy the sauce. That could have actually happened. Maybe he got wasted and decided to fight a stop sign. Good work, you get a B. Really? So, this is where we’ve bottomed out? We have homeless children, our public schools are dangerously underfunded, police shootings . . . you name it. 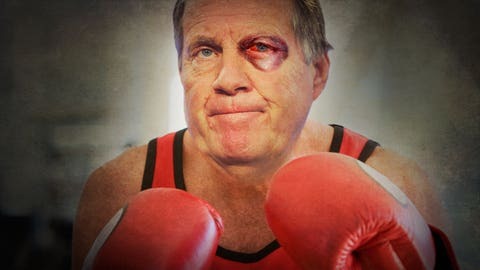 But us chatting about Bill Belichick’s black eye is the bottom of the barrel for you, eh? Take this F and go away. Haha! Wait, why is that funny? I’m not sure I get it, but I’m going to give you a B, just in case I was too stupid to understand. I included this tweet just to illustrate that I was inundated with many theories that involved something sexual. Either with Bill and Tom Brady, or Bill and Gronk, or Bill and inanimate objects, or group stuff with Bill and various celebrities, or Bill and prominent politicians, or Bill, Gisele and inanimate objects, or Bill with cameras and deflated footballs. Thank you, monkey. I couldn’t have said it better myself. I’m going to give all of them a C, which is the "kissing your sister" of letter grades. Uhhh, is that a real word? Well, I’ll be damned. It is! Accordig to the site, "virkelig" means "actual" or "real." I’m giving you an A for increasing my vocabulary, even though I’m not sure what virkelig has to do with Belichick. Meh, I still think he made the right call. It just didn’t work out. I’m sure if he tries that again in the future, it will go his way. Good job, that’s a B+. Speaking of Vontaze Burfict, that’s a knock on the door you never want to get. Probably from Vontaze. Another B+. See? I knew Tom would finally find someone to high-five, even if he aimed incorrectly and caught his head coach right in the eye. @RealSidSaraf @NFLonFOX Belicheck didn't like Tom Brady's Uggs.